Each Bulk package contains the equivalent of approximately 35 packets. Looks like gelatin. Tastes like gelatin. It isn’t. It’s better! 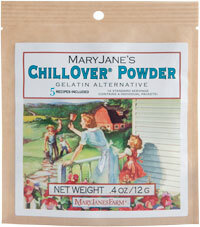 My innovative ChillOver Powder is for all the people who grew up loving gelatin desserts but gave up on them, knowing their animal origin. It sets up in half the time gelatin does. It seals in flavors more quickly. And it won’t melt at room temperature. This is a Project F.A.R.M. (First-class American Rural Made) product. Ingredients: Agar-agar kanten, an odorless powdered sea vegetable with superior gelling qualities—a MaryJanesFarm exclusive. Nutrition Facts: One 0.8 g serving equals 5 calories, 0 g fat (0 g saturated fat, 0 g trans fat), 0 mg cholesterol, 0.2 mg sodium, 1 g carbohydrate (0.1 g fiber, 0 g sugar), 0 g protein. Each order includes a booklet with tips, tricks, and recipes. Once you receive your order, you’ll be whipping up perfectly gelled sauces, jams, jellies, desserts, and more. Before you dive in, take note that when using ChillOver, the key to success is to slowly sprinkle it in while whisking to avoid any clumps, and to continue whisking during the 3-minute simmer time. 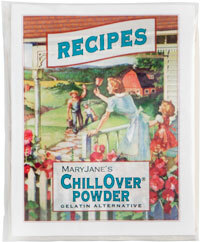 You can find more ChillOver recipes in my book, MaryJane’s Ideabook, Cookbook, Lifebook and the special recipe issue of MaryJanesFarm magazine, Farm Kitchen.